This is the newest addition to our family...LOL! 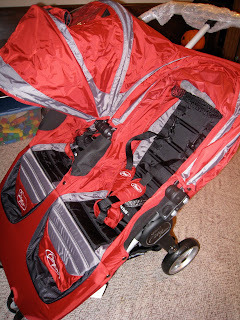 With #2 on the way, I debated about whether a double stroller will be necessary. I don't think E will be quite old enough to walk on his own yet...so I searched and got an amazing deal on this Baby Jogger City Mini Double Stroller! We can use our Chicco car seat that we already own and the two little ones will be able to use it for a long time. E had a grand time climbing in and out after I put it together yesterday. I definitely think it will be worth it!